"Ever since Man started to think, he wanted to fly. But flying was strictly for the birds." Back in the Hollywood heyday, big 70mm roadshow productions were not just movies, they were events. These were films crammed with star power and cameos, all built around sweeping stories that did what they could to push the envelope for what would normally pass for traditional and comparatively understated theatrical entertainment. 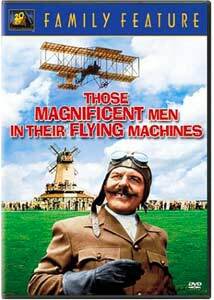 The roadshow picture is a lost bit from Hollywood's olden days, but in 1965 prolific director Ken Annakin tackled the widescreen spectacle of the genre with Those Magnificent Men in Their Flying Machines, a 137-minute blend of comedy/action/romance about an airplane race from London to Paris in 1910. Growing up in the late 1960s, I eagerly looked forward to any television broadcasts of TMMiTFM, and it wasn't until years later that I realized another eerily similar film that I loved just as much—Those Daring Young Men in Their Jaunty Jalopies (1969)—was also done by Annakin. Who knew? It's interesting to take a look at this a few decades later, and to see that Annakin really did put together a visually impressive film for the time, one that is unfortunately locked in the kind of slow, leisurely pacing that sometimes seems forced for the sake of adding to its runtime—something that he alludes to in the accompanying commentary track. The big race itself is almost secondary to the planes (it takes well over two-thirds of the film before that occurs), and, of course, the introduction of the various international characters who will be piloting the bizarre flying machines for Germany, Japan, Italy, the United States, Britain, and France. Using a mix of cranes, process shots, and actual planes, Annakin ended up with a beautiful-looking film that is weighed down by backstories and minor subplots. The story is where the wheels fall off, and maybe as a wide-eyed 9-year-old I was willing to overlook some of the meanderings in favor of wacky airplanes and colorful villains, but as an adult the characterizations flatly go beyond the point of simple stereotypes, and the jokes are broad and telegraphed loudly. The race is the payoff, but it takes forever to get there, and in between, scenes play on far too long. Sure, it was cute to see the recurring gag of lovely Irina Demick showing up as a handful of different women rushing to the aid of a pilot who is constantly crashing, and Terry-Thomas makes a gloriously despicable cheater, but the blandness of Stuart Whitman as the heroic American flyer only makes all of the other fliers seem that much more cartoonish. I think the biggest thing that struck me about watching this again after all these years is that my recollections of what made this so memorable in the first place are, in fact, still the best thing about it. The airfield sequences are beautiful, expansive and colorful, and when the odd-looking planes take off from it, Annakin really shows it off well, a few tacky process shots notwithstanding. Youngsters of today might not appreciate the interminable buildup, but this was high-quality family entertainment back in the day. I was a bit disappointed it didn't hold up as well in the story department as it did visually. Image Transfer Review: The colors on this 2.20:1 anamorphic widescreen presentation of Ken Annakin's slightly long-winded roadshow are bright and full of life, and give this presentation a real pleasing boost. A film like this really needs the full 70mm experience to soak in the whole broad spectrum of this larger-than-life comedy, but on DVD the detail and image clarity are rendered quite well, so much so that the process shots look comparatively awful when compared to the action sequences using actual planes flying. The transfer suffers from a few understandable age-related issues, specifically relating to things like color flicker and a bit of soft grain here and there, but overall this lack of any major blemishes or flaws is fairly impressive, considering it is getting up there in years. Audio Transfer Review: The Dolby Digital 5.0 audio mix, while presentable and clear, is not nearly as memorable as it could have been, and appears to be a moderately trumped up version of the film's original stereo track. Rears are used infrequently (if at all, I wasn't really aware), and though there is some distinct directional pans across the front channels, there isn't any real spatial depth to anything. The absence of any substantial bottom end makes everything come across a bit too harshly, and this 5.0 mix doesn't really come close to living up to its potential. French and Spanish mono tracks are also available. Extras Review: Director Ken Annakin contributes a scene-specific commentary track, and it runs the entire 02h:17m:52s, including straight through the five-minute intermission. As much as I don't necessarily feel the film holds up as well today, I have to admit that Annakin's commentary does, and he provides a inordinate details on things like casting, camera plane operations, and creating the aircraft. Annakin is relaxed, informative, and, in short, does what very few commentaries can do, which is not make you mind sitting through a film for the second time. Also included is A Conversation with Ken Annakin (16m:54s), which covers a lot of the same ground, but in an understandably shorter timespan. There is a rather large stills gallery, broken down into Behind-The-Scenes, Visual Effects and Historical Aircraft, as well as a few original storyboards. The disc is cut into a meager 28 chapters, and features optional subtitles in English or Spanish. Time has tarnished the wings a bit on this once grand roadshow comedy/adventure, but Fox has dressed up this budget-priced release with a terrific commentary track from director Ken Annakin.